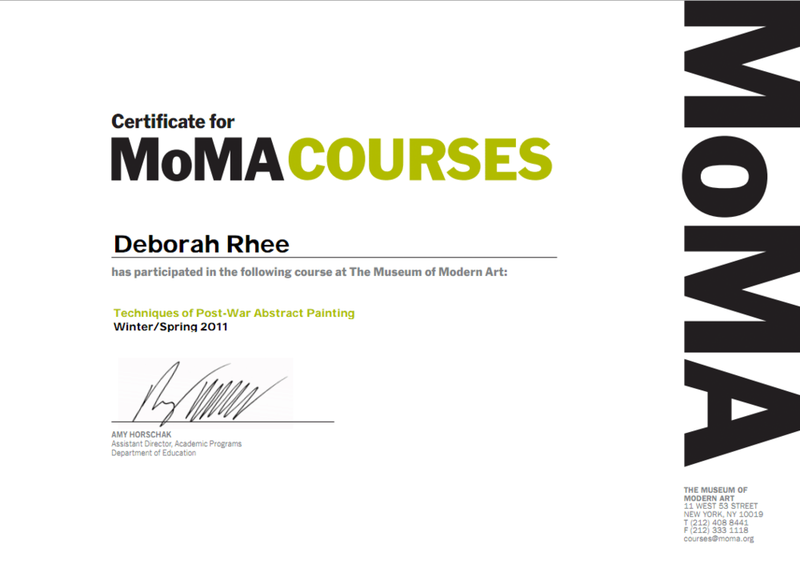 At the completion of the course, MoMA students receive a certificate by email. 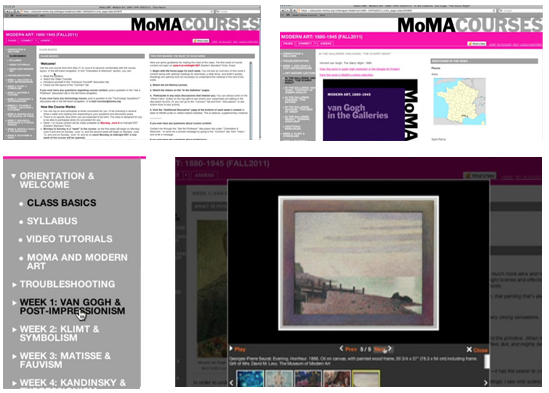 Each week’s lesson includes a Art History video lecture on a specific artist, 3-6 videos from the gallery with a ‘visual unwinding’ of the artists’ techniques, articles, slideshows, suggested readings, links to artwork on the MoMA site, and a detailed studio video demonstrating the techniques of an artist. The studio course totals about 20 hours of video footage. The art history survey course has 25% less video since there’s no studio component. The New York Times Knowledge Network offers a variety of online courses, generally taught by Times staff. The network is a good example of a traditional publisher exploring new revenue models and ways to inform the public. The courses are diverse, ranging from the arts to business to science. Some courses offer credit via partner schools. Many NYT courses focus on personal skills, typically various kinds of writing (e.g., writing medical memoirs), last 4-10 weeks, and cost $200-1,000. 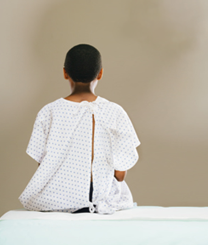 The 4-week “Writing A Medical Memoir” course ($225) was created and taught last year by Times reporter Denise Grady. The outcome of the course is that students produce a personal memoir of their experience with illness or injury. A good friend of this blogger took the course and found it very meaningful. Writing a medical memoir is a very good candidate for an online course. “Some people had recently been quite ill and I think it made all the difference for them to be able to do this from home,” says Grady. Also, discussing a personal issue requires discretion in how they get feedback from their instructor and classmates. The course began by reviewing four essays that illustrate superb writing, and then the instructor coached students in writing their own essays. There were daily self-paced lessons, online discussion forums and web links, and scheduled online chats. 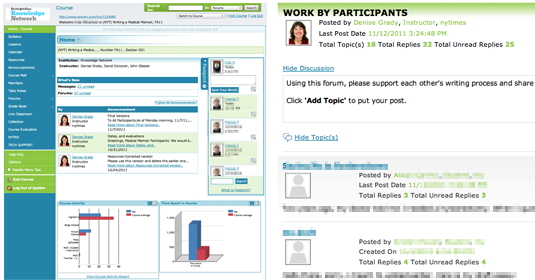 The chat sessions and course contents were archived for students to review any time in the future. Online learning is flourishing in the knitting and crocheting community (see my post about the Ravelry online knitting community). Craftsy/Sympoz is an internet startup based in Denver, Colorado, offering 35 courses on various crafty topics, from knitting socks to quilting. Tens of thousands of students have taken their online courses, priced from $15 to $60 for unlimited access. They also offer occasional free courses to spike interest. Craftsy courses consist of a series of video lectures, written documents, open Q&A-style discussion, plus video bookmarking, note-taking and private messaging. There is no fixed schedule, students come and go freely. In Craftsy, there’s a clear progression of steps through the course, easy access to course materials and notes, and an active, threaded discussion. The videos are designed to be displayed on screen, as part of the course. The NYT Knowledge Network user interface is hard to use, ugly, and inefficient. They use the Epsilen course management system, which is designed for school administrators, so it includes lots of irrelevant features like grade books and quizzes, while key functions are buried or broken: It takes multiple clicks to read single messages from fellow students, and uploading documents breaks their formatting so they are hard to read. Following are two screenshots, personal details obscured. As a work-around, Grady says she used email to directly communicate with her students. The NYT medical memoir course had the simplest development process because there was not extensive curricula to prepare before the course launched. Grady took the better part of a day to plan four short intro videos, and a few hours for a casual shoot. Unlike the knitting videos, which need high quality closeups, the purpose of Grady’s videos was to set the scene, and they kept it “very quick and casual. Not a huge big deal. My hair looks awful.” Grady says she “taught it the way I would have taught a regular classroom course, except they could see me and I couldn’t see them.” Once the course started, however, the workload became very substantial, consuming all her free time and more. 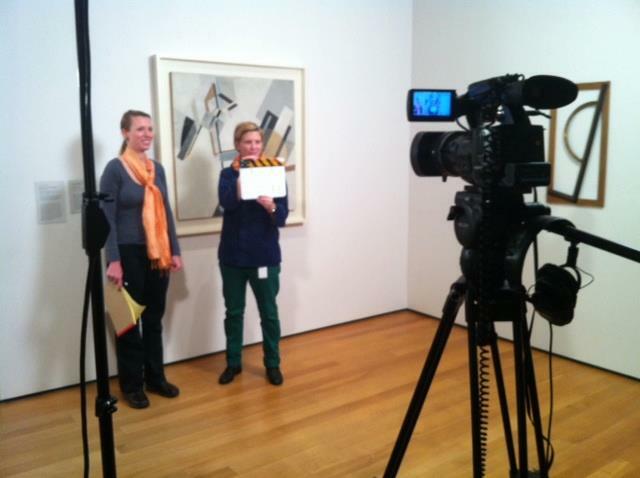 Shooting a video of El Lissitzky at MoMA for an upcoming course. 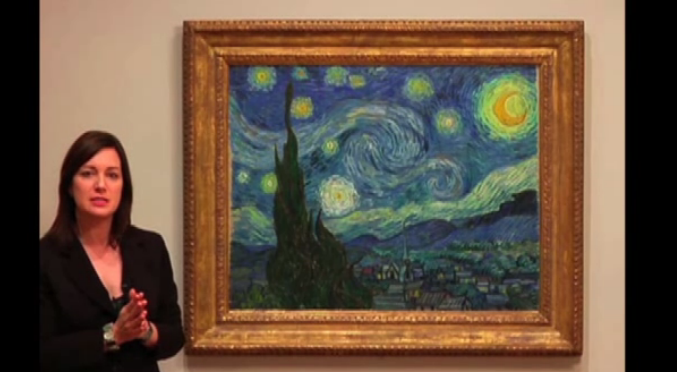 The MoMA courses are much more complex to prepare. The most time consuming part of creating courses is planning, video production and editing, says Woon. Shooting videos in a large museum like MoMA requires a lot of coordination between departments. It takes around 10 months from concept to launch. The development team is two full-time digital learning staff plus an adult & academic programs staff member, and an intern. The team collaborates with the instructors to build the course and manage an outside crew who shoots and edits the videos. They start by running an instructor-led course, and then spin off a self-guided course the following semester, with some improvements based on first semester evaluations. The self-guided courses are edited to be flexible, since self-guided students may take a nonlinear sequence through the material. Students have a range of experience levels, from complete novices to working artists with long exhibition histories. Students are predominantly female, aged 30 and older, and 55% of them are from the U.S. Woon says student’s primary motivation is “their belief in MoMA’s authority in modern art” and “they expect a high-quality experience.” Secondary motivations are “flexibility and accessibility”. Wickenhiser-Schaudt, the online student, said the classes are for serious students who do not live close enough to the MoMA to take in-person courses. The knitting courses have a shorter production cycle. Courses are planned by the instructors, who typically work in the craft field as authors and teachers. Instructor Linda Permann said it took her a few months to outline and develop her course. Once the course is developed, there is a ~3-day video shoot (using HD video) with the Craftsy team and a film crew. Professional video editors produce finished videos. Above is the studio of Carol Ann Waugh during a Craftsy filming. Craftsy loads the content into their proprietary course management system, developed by their parent company, Sympoz, which handles the technical details of course registration, displaying video and written materials, and online community. Sympoz is expanding their formula to other topics, such as cooking and personal finance. Nearly 400,000 people have created accounts with their site. At this time, the Sympoz backend is not available to use for your own projects. These courses may be online, but the human experience is vital for all of them. In the memoir course, students’ experience centered on Grady’s careful reading and feedback of their essays, and discussions with peers. Some students “had been through such wrenching experiences that they developed the kind of camaraderie you find in people who really been in the trenches,” says Grady. Students discussed online, though the poor user interface made it hard to follow discussion threads, and students chatted less than in the MoMA or Craftsy courses. A course like this is intimate. Grady says the ideal number of students is low, no more than 25, because she spends a lot of time working with them. Student interaction is a vital too. The online discussion forums were buzzing with approximately a dozen active student participants. D’Augustine said that, “week to week, I’m amazed at the discussions that have taken place between students in, say, Moscow and Miami, Caracas in Colombia, or Croton-on-Hudson in New York.” Dallas artist Deborah Rhee said in a blog post that it was “a full-time job keeping up” with discussions in a section of the web site known as ‘The Cedar Bar.’ UK artist and art teacher Mania Row says she is still in touch with her fellow students. The availability of the instructor has a big impact: in one D’Augustine course, he had other obligations at the same time, and students complained he was aloof. In another course, students said he was attentive and responsive. Rhee said the course was “actually more intensive than being in class for a few hours a day,” and said her “personal art practice has most definitely matured” from the first MoMA online course she took. Rhee feels “it is the best investment I have made for myself and my Arts practice since beginning my journey in Art a decade ago.” Similarly, Wisconsin artist Myrna Leigh said in a blog post that the painting class she took in Fall 2011 was “informative and fun,” and she introduced the new techniques she learned into her work. Enthusiastic students continue the discussion on an official MoMA alumni Facebook page. Craftsy’s instructors are charming and idiosyncratic. They directly address the viewer, and convey sincere enthusiasm. They’ve honed their stage presence with years of in-person classes at local stores, craft conferences and retreats. The good instructors are diligent about logging in daily to answer student questions. Meanwhile, each Craftsy course builds an archive of questions and answers, and general chit-chat. There’s enough usage volume, and students will often reply to other students. In crafts, everyone is an expert on their personal experiences, and knitters love to talk about their favorite yarns and colors, and commiserate over small mistakes. The chat in the paywalled communities of Craftsy differs from that on the free community at Ravelry in that the discussions tend to have a much more on-topic “course” type of feel. Denise Grady is an experienced science and health reporter at The New York Times. She says she “dreamed up the course and got excited about the idea of helping people tell stories about life-changing events. Forgive me if this sounds trite but it is kind of a labor of love. It’s very intense, and rewarding. Quite fascinating. People show up with remarkable stories. It sells out every time.” The course doesn’t bring in much revenue (approximately $6,500), and Grady still had her full-time newsroom responsibilities while teaching. “The time commitment was huge,” Grady says. “Tens of hours, is the best way I can put it. Hours of preparation for each online session even though they were only an hour apiece. Many many hours reading drafts, commenting on them and returning.” Due to the workload and drain, she declined to teach this spring, and another Times journalist, David Corcoran, is teaching the course instead. Grady hopes to teach again in Fall 2012. Donna Druchunas teaches three knitting courses (all priced at $60), and has over 5000 students enrolled. Craftsy is a significant income source for Druchunas (the $300k+ revenue is shared between her and Craftsy) and also a way to indirectly promote her books. She has authored several knitting books, and teaches in-person classes at local yarn shops and at knitting conferences and retreats on topics such as rug knitting, making yarn, and knitting socks and sweaters. She acknowledges that online courses make it harder to detect confused or frustrated students, but that’s mitigated by the clearer instructions in an online setting where students “can see things close up and replay the videos over and over again as often as they want.” While she can’t directly observe students working, she can comment on photos students upload. Druchunas spends ~15 minutes a day answering new questions in the courses. Linda Permann teaches two crochet courses (priced at $30 & $60). She is a full-time crochet designer, writer and teacher. She has a few books, an ongoing column in Crochet Today magazine, and writes for other outlets. She finds teaching personally rewarding, and also useful to “stay in touch with crocheters and what is ‘hard’ for them.” She says that many communities lack convenient local crochet classes, “so I really wanted to jump in and provide a couple of intensive classes that would help people grow their skills.” Permann logs in once or twice a day to answer student questions, and her daily workload is ~20 minutes. Stefanie Japel teaches three courses (priced $30-60) and a free mini-course, with a total of 16,000 paid and unpaid students. Japel is an author and teacher, as well as a staffer with Sympoz. A few years ago, she was a new mom, with a toddler and an infant, and she was unable to keep up with traveling to events for teaching. She started teaching online using Ning, where she started with shorter (4-8 week) courses, and amateur quality video. At Craftsy, the video production is a high level, courses never expire, and there’s a support team (designers, tech support, help desk, customer support). Japel invests an hour a week to maintain her three classes and the free workshop, answering questions and talking with students. Japel has found the online and in-person courses complement each other. For example, in recent in-person courses she taught with Interweave Knitting Labs, 20% of the 25 enrolled students were already taking the online course and wanted to see the class live. Conversely, after the in-person course, several of the in-person students signed up for the online class. Your organization could launch your own courses, adapting the models above as a starting point. The classes can have the side benefit of institutional branding; Woon says students report they feel connected to MoMA after taking the course. Courses that require heavy involvement from an instructor don’t scale beyond a few dozen students, but they can be very meaningful learning experiences. The MoMA and NYT examples above involve large amounts of time and commitment from both students and the instructor. (Both MoMA and NYT also have self-guided courses that are more like online lecture series, and are more analogous to the Craftsy video series.) In the case of MoMA, there’s also a large up-front investment in video production. 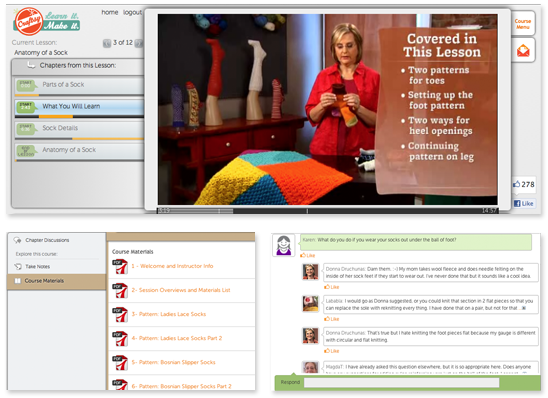 The Craftsy model is a slick and appealing presentation when most of the information can be taught by video. Economies of scale with the Craftsy approach allow for lower course fees, and substantially higher revenue. Updates: 24-Jan: Corrections from Grady and Woon clarifying some details.